At any rate, for me, week ten is the panicky-OMG moment when I realize that I am still having trouble with a phrase or two that I was having trouble with a month ago. It’s the week I clean up those last details. Hopefully. As usual, the warmup exercises were sec ret workouts for phrases in the music. No goof-off time in this group! This week we smoothed our transitions between vowel sounds used in the Fauré. Afterward we applied all that work by singing through Sanctus and Offertory. There were some very nice moments. We then switched gears (to put it mildly) and sang “Winter Wonderland of Snow,” a mood change that was not for the faint of heart. The rehearsal was jam packed. We pretty much sang through the all of the pieces with Allison taking frequent notes. Seems as if she will have quite the list of notes for us next rehearsal. Hopefully it’s not too scary. I always like these later rehearsals when we start making it through all the music, because you can feel huge pieces of the puzzle shifting and settling into place. 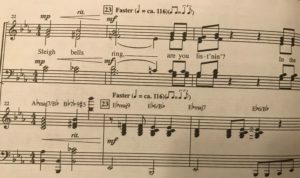 Another aside: My favorite section in the Rutter is Blow, Blow Thou Winter Wind, especially after Kathy let us know that it comes from “As You Like It.” Well, actually, it was my favorite section until I learned that there are places in which the basses are more important than the tenors. How can that be? Is it even possible? I mean, we’re tenors! The cruelty of the world is really quite mystifying and heartbreaking. The song is now home to more ingratitude than just weather and man! If the poem was sad to me before, it’s become even more so now. Less than 30 days left.